Just Do It is the slogan of the American brand NIKE, a declaration of intentions, which year after year continues to encourage all who love this sports clothing giant. 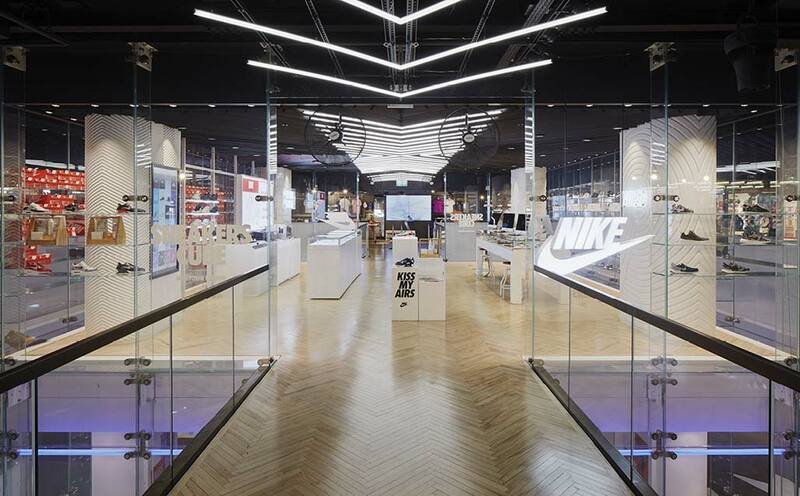 As one of the most globally renowned brands, the NIKE company takes care of details not only in its garments, but also in its facilities, and on this occasion it is the turn of the flagship store in London, located in Oxford Street. Located in a spectacular neoclassical building with a contemporary interior, its renovation has used the solid surface from PORCELANOSA Group, KRION®, in the covering of the four columns that make up the aesthetic connection between the three floors, created as the main focus of the spacious facilities. Nike Town Oxford Street does not only sell products; customers can personalise their colours, designs and characteristics. This is also true of KRION®, a material which allows any type of project to be personalised to unprecedented extents. Uxbridge company AR18 Ltd, experts in KRION®, were in charge of manufacturing and installing the columns, created with 19mm KRION® Snow White 1100, on which the shoe sole design required machining and thermocurving our material, a complex work which AR18 completed in an extraordinary way.